The last three weeks of January is one of the best times for a Costa Rica vacation. New Years is also great from the perspective of weather but it’s crowded and peak season surcharges make it one of the most expensive few days of the year. All the best tours and activities are going full blast and the wildlife is abundant and active. Any of our “Best Trips Ever” take advantage of the beautiful tropical weather this time of year. Costa Rica January rainfall patterns. January is the beginning of the dry season. Clear weather is much more reliable on the Pacific side. 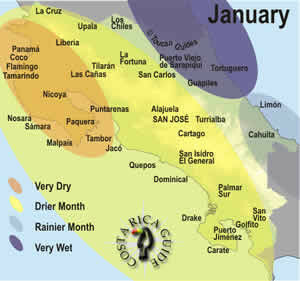 January the first reliably dry month at the beginning of Costa Rica’s Pacific side dry season. The northwestern (Guanacaste) and central regions (Jaco, Manuel Antonio) of Costa Rica have little rain and mostly sunny weather. What little rain falls usually comes as afternoon or evening showers. In January strong winds are common especially in the northwest. These “Papagayo” winds are the result of cooler, dry air moving down from North America and displacing the moist, warm dense, tropical air mass. The pressure difference causes winds that are accelerated through gaps in the central mountain ranges and can exceed 100 kph. On the Caribbean side of the central mountains it’s wetter especially in the northeast where polar air pushes across the Gulf of Mexico picking up heat and moisture then depositing it as continuous days of rain referred to locally as temporales del Atlantico. With no rain to cool things down on the Pacific beaches and in the lowlands highs of 86 to 94 °F (30-35 °C) with lows only dropping a few degrees to 76 to 84 °F (25-29 °C) overnight make air-conditioning a nice amenity. Heading to the mountains for part of your vacation this time of year can be attractive since daytime temperatures around the central valley are usually 75 to 85 °F (24-29 °C) in January and it cools off more at night. A day or two of temperatures in the mid nineties (35-37 °C) is possible at low elevations and especially in Guanacaste and on the Nicoya coast during January. Not only is January one of the best months to travel it is also one of the most popular. It’s the heart of the high season for international travelers and the middle of the school holidays for Ticos so activities and accommodations fill up quickly. We traveled all over Costa Rica in January of 2018 and again in 2019 and found bigger crowds and lower availability than ever before. Later we saw statistics indicating that large numbers of travelers who traditionally visit the Caribbean decided to try Costa Rica instead because of the devastation in places like the Virgin Islands, Barbuda and Puerto Rico during the hyperactive hurricane season in 2017. January 2020 is looking to be even busier and reservations are already setting records. Booking ahead (as far ahead as six to twelve months) is a necessity for the popular higher quality mid-price, superior and luxury class hotels, lodges and resorts. Budget and mid-priced hotels that rely on walk-in or direct online booking clientele also fill up fast so if you’re traveling without reservations plan to arrive early in the day and stay flexible with price range and expectations. Prices reflect the popularity of travel at this time, high season rates are in full effect, and most hotels and lodges in the mid and luxury price ranges add a holiday surcharge for the first week of January. Many hotels and lodges that have dining rooms throw New Years Eve parties. Dinner and dancing are often mandatory for all guests and included in the room rates for the night of December 31 adding between $50 and $150 per person. Many accommodations also have minimum stays ranging from three to seven nights over New Years so you should check the fine print carefully when booking. Reasonable airfares are available for advance purchasers, but most have sold out by November when prices typically climb by 20-50%. If you like the sound of Dry Season, but would prefer to avoid the crowds try traveling in February or early March before the Spring Break and Easter crowds arrive. Even though late 2019 and early 2020 are likely to be a La Nada Southern Oscillation pattern which normally means more unpredictability in the weather the dry season will be in full swing by January. “Summer” School Holidays—The long public school vacations in Costa Rica run from the middle of the second week in December through the beginning of the second week in February. Expect families on vacation and bigger crowds at the beach. All of January is always included. approximate exchange rate ¢621 per $U.S. New Year’s Day – Revelers who were partying in the clubs the night before gather in San José’s Parque Central and Buenos Aires, and Puntarenas to continue the festivities at dances. Día de Santo Cristo de Esquipulas – Popular religious festival celebrated with fiestas and dancing in Alajuelita, Dulce Nombre and Santa Cruz. Alajuelita also includes an ox-cart parade and procession to the iron cross on the mountain above the village where a blessing is given.